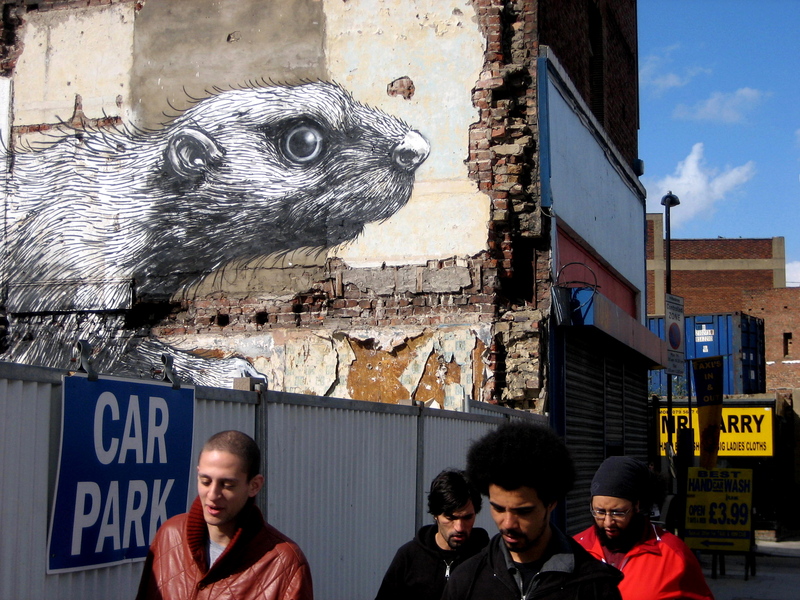 It was last Autumn that Roa’s squirrel and rat first caught my eye, and then earlier this year I discovered a whole host of vermin that the prolific Belgian street artist had painted in Spitalfields. Now, as you can see from this tall bird that appeared at the junction of Hanbury St and Brick lane last week, Roa is back again, and he has taken the opportunity to further populate our neighbourhood with his distinctive, finely drawn creatures. I was walking down Hanbury St when I looked up, unexpectedly, to see Roa hard at work painting on the top of a motorised cherry picker, high above my head. He was adding the black hatching onto the white base coat and I craned my neck, watching as he used strokes of the spray can to make each of the individual marks that characterise his highly recognisable style. From the cradle of the cherry picker, at arm’s reach from the wall, Roa could only see directly in front of him, so in his left hand he clutched a sketch that allowed him to see the entire figure, while he wielded the spray can in his right. 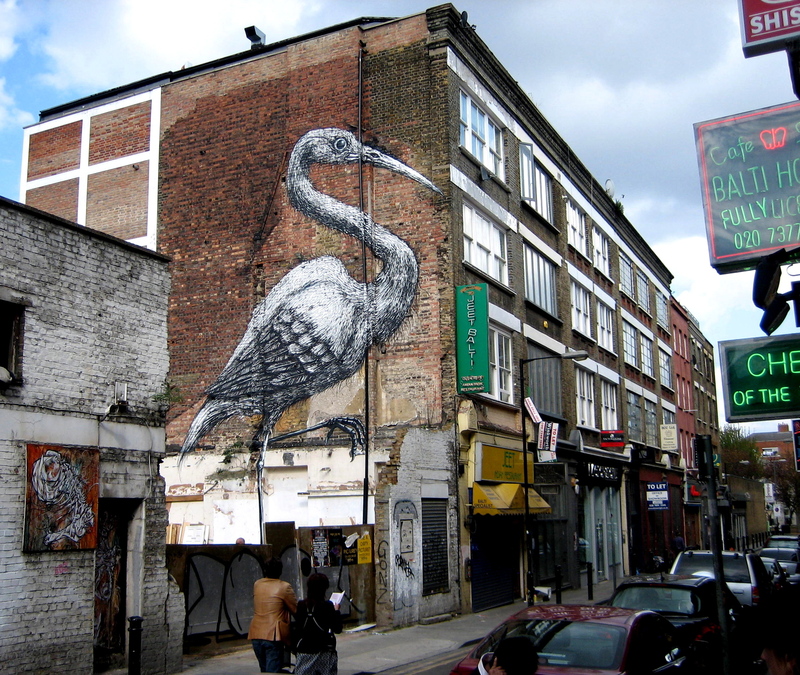 Charlie Uzzell Edwards, curator of the Pure Evil Gallery, said that Roa’s intention had been to paint a heron but, after being asked if it was a crane by Bengali people – for whom the crane is a sacred bird – Roa morphed his bird into a crane to best complement its location on the wall of an Indian restaurant. Charlie also told me that Roa always asks before painting his creatures onto walls and has discovered that many owners are receptive to having large paintings enhancing their buildings, which can become landmarks as a result. The truth is that since these paintings take four to eight hours to complete, it is not an option to create them as a hit and run operation, especially if you want them to last. Roa’s fine draftsmanship sets him above other street artists and I particularly admire the vivid sense of life that he imparts to his creatures, which transfix you with their wide eyes. The anatomical detail of these animals is lovingly achieved, yet they are unsentimental portraits of feral beasts that demand respect, resisting our simple affection. Their looming scale and piercing gaze can be challenging – charged with tension, their eyes always follow you. Similarly, any human figure you see in the vicinity of these paintings unavoidably exists in relation to them, a measure of their fierce intensity. For the most part, Roa places his animals in unloved, unrecognised corners of the cityscape that are the natural home for scavengers and vermin. But once these spaces are inhabited, the creatures become the familiar spirits of their locations, living embodiments of these places, and our relationship with them parallels our feelings about the streetscape itself. Their powerful presence no longer permits us to remain indifferent. Since Roa was last here, he had a sellout show in Paris and then returned to stay with Charlie for three weeks this Spring. Spending a week installing his show in the gallery, he did some huge paintings directly onto the walls, before setting out to find spaces and create new works around the streets of East London for two weeks. A pair of distinctive new creations that are definitely worth the visit are to be found in the Hackney Rd – the beaver and the rabbit are both poised in a quivering moment of life, ready to bound away. Placed on the sides of old buildings and peering out into the street, they enliven this stretch of the road for drivers and pedestrians alike. 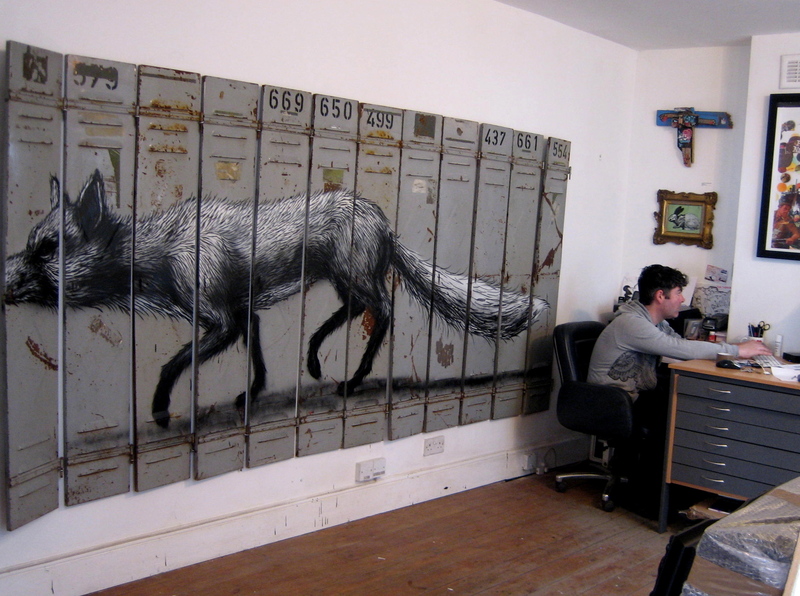 Charlie explained that Roa is off to New York for his first show in America, at the Factory Fresh Gallery in Brooklyn. Taking no works with him, except a set of images, he will undertake a series of paintings there in the gallery and on the street. Once that is complete, he is going next to Mongolia to paint horses on buildings. Then in July we shall see him back in Spitalfields, when you can expect to see the next brood of creatures proliferating on the street, and I hope to accompany Roa and write an account of the painter at work, because I am curious to know if the mind of the artist is as febrile as his creations. In the meantime, you can find a map below of all Roa’s street work in the neighbourhood, as the basis for a walk to take a closer look at these fascinating paintings for yourself. How fabulous, what a talented artist. Love your blog by the way. Only just found it. That ‘rabbit’ is definitely a hare by the length of its ears. I love the way you preface Hackney Road with ‘the’ – mark of a true Londoner. Your blog goes from strength to strength. Don’t forget La Rochetta (if it’s still there….). Thanks, lovely pictures, I will try to get down your way to see them. I spent a long time once for reasons that escape me listing which London roads with placenames have “the” added and trying to work out the logic. Never quite worked it out, think it’s just a tradition thing. 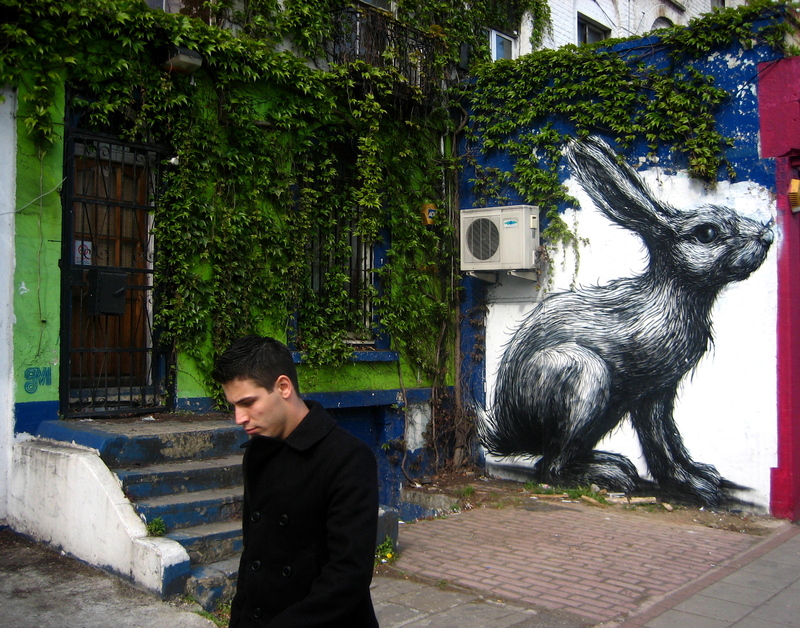 I think Roa’s work is truely inspiring. It brings a tear to my eye to see someone so passionate about dead animals. This is also my hobby, I collect dead animals and draw them and then use them for my sculptures. I used to think I was so alone in the world and I used to be bullied because of my weird habbits. It brings a tear to my eye to realize I am no longer alone. I’ve just found your blog and I love it! You bring ROA’s art pieces to life with the way you write it. 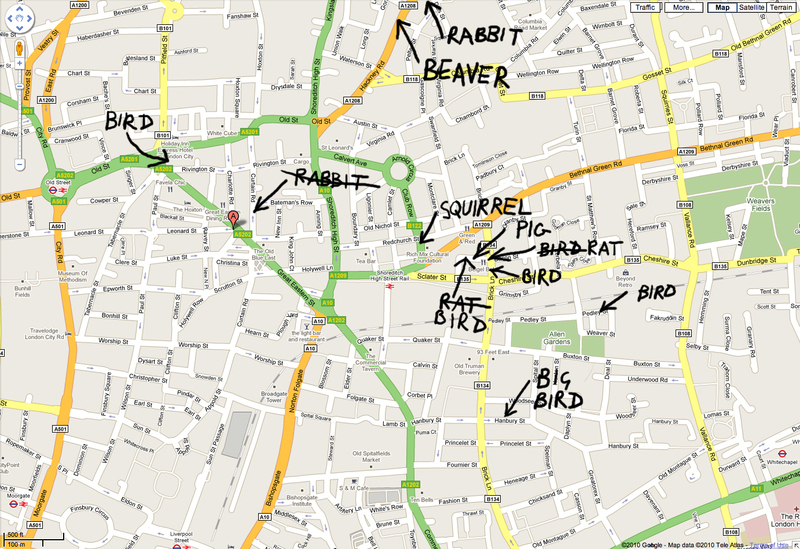 I’m a Sixth Form student doing AS Art and this has really helped me find information about where some of ROA’s work is. I look forward to reading more about him!